Empanadas are a truly a delicious treat. You can eat a few for lunch, as an afternoon snack, or as an appetizer to your evening meal. Really, in terms of how you eat them, your options are limitless. When it comes to preparing them yourself, you can get even more creative. Especially since empanadas are not widely available in the United States you really have no other option then to make them yourself. Once you get the basics down, you’ll be making empanadas all the time. To make them even healthier, experiment with fish and shellfish options for more nutritious benefits. Making empanadas is quite simple. Basically you have to make the dough, prepare the filling, and decide whether you will fry or bake them. The type of dough you prepare varies. Some recipes are little more than a basic bread dough recipe, while the more authentic varieties include either lard of butter for a more pastry-like effect. For these latter varieties you typically need to wait a few hours to let the dough rest before cutting it into circles and preparing the actual empanadas. The second part in making empanadas requires that you select the fillings and prepare this filling to be wrapped in the dough. Whether using fish, shellfish, or any other type of meat or poultry, you should first cook the chosen filling, adding your selected seasonings as well. Once this is prepared you might want to add cheese to the mixture as well for extra flavor. With the filling ready, you’ll need to start forming the empanadas. To make the empanadas you’ll need to form circles with the dough. The larger the circle, the larger the empanada. From there you need to put a few spoonfuls of filling in each circle, then fold the circle in half and seal by either folding the dough or using a fork to press the two edges together. 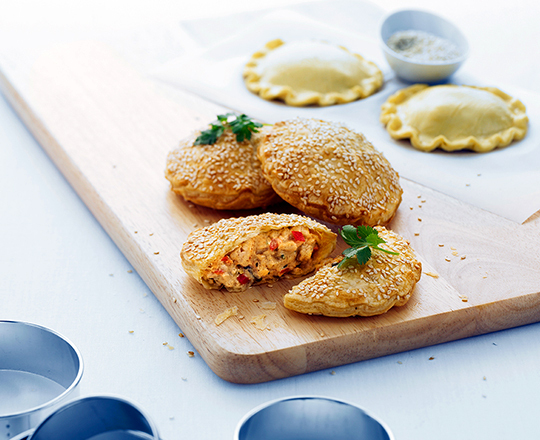 With your oil or oven heated, within 10 to 12 minutes your tasty empanadas will be ready to be enjoyed. If you’ve chosen to make fish or shellfish empanadas, you’ll be happy to know that your selection of filling is perhaps the healthiest around. With good amounts of omega-3 and omega-6 fatty acids, your body, as well as your taste buds will thank you. You can do even further good by selecting sustainably acquired products, such as those from Alaska and other seafood producing regions. Your body and the environment will be all the more healthy!